One food at a meal is ideal! The safest way to eat on a daily basis is to eat simply. It is helpful to keep a log of everything you eat and are around. Once you have your health under control and feel comfortable with this new way of eating, add in more recipes and ideas. In time you will have your own program. Drink 8 glasses of water from a pure source a day, but never with food. Your goal is to aid digestion not slow it down. Take it slow and be forgiving. Eat fruit at least 1/2 hour before other foods. 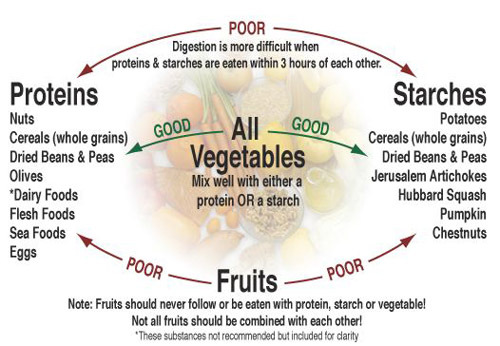 NOTE: Any combination of vegetables may be mixed with either one protein or one starch per meal. Never mix fruit with anything. Eat fruit at least 1/2 hour before other foods. 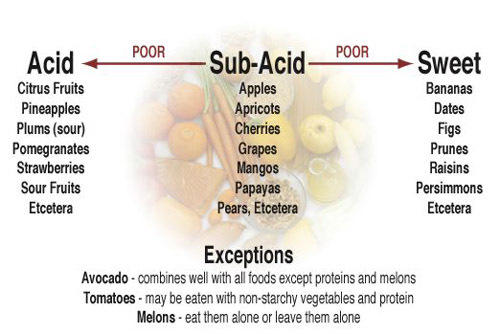 Fruits and vegetables should always be eaten at separate meals. Eat only one concentrated protein food or starch at a meal. Drink your water or fresh vegetable or fruit juices 30 minutes before your meals. Otherwise, avoid drinking liquids 30 minutes before meals, during meals,. and for one to two hours following meals as liquids dilute the digestive juices and hinder digestion. Avoid drinking liquids which are too cold (out of the refrigerator or with ice) or too hot (close to the boiling point) since the temperate extremes stress the digestive system and may cause indigestion. Since most dessert items do not combine well with foods eaten at meals, it is best to avoid them or eat as a full meal. Avoid eating immediately before or after strenuous exercise. Avoid eating when under physical or mental distress. Thoroughly chew all foods and juices. Avoid eating three to four hours before retiring to bed. Fruit or fruit juice can cause a wakeful unpleasant night's sleep. You will sleep more soundly without fruit.